From the welcoming light of lady liberty to the tiki torches in Charlottesville... 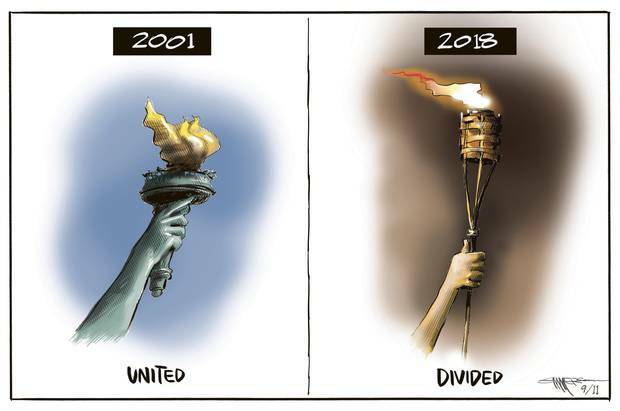 The tragedy of 9/11 banded America together, but in the 17 years since it has become divided. Al qaeda must be cheering. Their aim was to destablize the West. The climate was ripe for this critical mass to be energized. I don't like anyone who actually identifies as a **** or who pushes racial intolerance. That being said, there are maybe 3500 or so Tiki types in the entire nation. The ones in question got a permit to speak publicly. To not allow people to gather and speak is anti-American. The death in the Charlottseville rally was sparked by armed protestors chasing the guy around who ran the woman over. Both sides in that situation absoluetly were wrong and at fault for her death. But there are a few thousand of those types in existence. They're not reality, they're not at the forefront, and they're widely rejected by Trump and everyone who supports him. Compare the media coverage of that event vs how they treat Antifa and ask yourself why we're divided. The election of Donald Trump was a coup for the Russians and anti-American elements around the world. We have referred for so long to our exceptionalism and to the strength of our democratic system. What was exposed during the 2016 campaign was the web of racists, xenophobes, and misogynists that still populate our nation is numbers far too large for a country that purports to espouse the ideals that we tout. The flaws in our electoral/voting systems were used against us. Putin and the Russians exploited the social divisions and the weaknesses arising from one of our major political parties' willingness to put party before country. It is a disgrace we are going to have to rectify at the ballot box, if indeed our electoral process has not been fatally compromised as it exists now. IMO, we should return to paper ballots and dump the hackable voting machines, even if it takes a bit longer to determine winners. False equivalencies are not going to impress people who have informed themselves. Yeah maybe it is worse to crash someone's free speech event and chase them around with a rifle than it is to attend that event in earnest. You are at the bottom of the Trump Kool-Aid vat without an oxygen tank. Time for you to kick to the surface and face reality. Trump is in free-fall. He's depending upon you and meach to get out there with a blanket and catch him. Hold those corners tightly; he's a large man. Once again you have the story wrong. You have a habit of spamming this board with inuendo and opinion. While you may believe that Twitter nonsense as fact it is not. James Fields was a not-zee azzhole with photos of him holding white supremeist shields in VA. Eye witnesses and cameras show him slowly creeping up to the protesters, reversing and then speeding up and ramming the crowd. He killed Heyer and injured nineteen. The racist asshat drove from OH to VA to cause trouble. Armed protesters were not chasing him with a rifle no matter how many times you say it. He made his choice, unprovoked. As a matter of fact after all the available evidence was looked into his charges were upgraded from 2nd degree to 1st degree murder.